This feature allows you to create promotional codes or discount codes to be distributed to your customer. Your customer then use these codes and insert the codes into the Payment Forms to enjoy discounted price. 1. Set the promo code fixed value, for example, for RM5.00 insert 5. 2. Set the promo code by percentage, for example, for 10% insert 10. 3. Set the validity of the promo code from a specific day to a specific day or from a start date to an end date. 4. The promo code feature is applicable on and valid to all of your Payment Forms. 5. The discounted amount is from the total price including delivery charges. 6. You also can track how many people use the promo code from the listing page on your Dashboard. 7. Once you have set your promo code feature active, a hidden field of Discount Code & Discount Amount will be visible in all of your Payment Forms (both of these fields are hidden if there is no active promo code). 2. Go to Menu > Discount > Create New. 3. Enter the preferred data accordingly. 6. 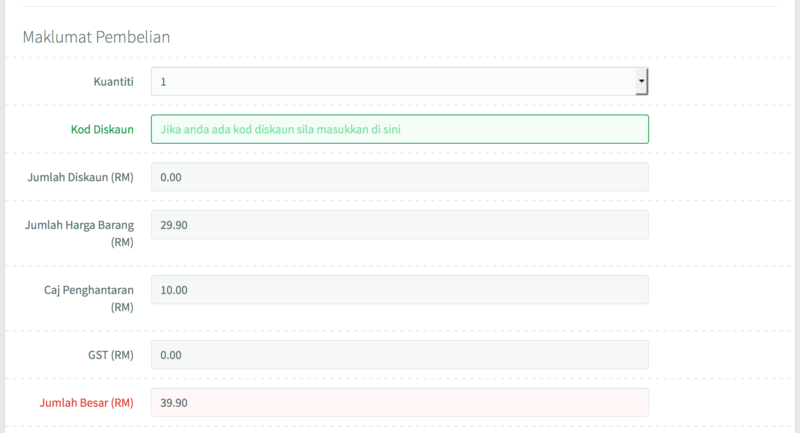 Now, you need to double check the effect to confirm your promo code feature is ready. Go to Menu > Discount > List. 7. You should see the promo code that you just created. Below are some examples of promo codes created. 1. This is an example of promo code usage. The promo code is SALES50, a 50% discount. This is the screenshot setting of the promo code. 1. This is an example of promo code usage. The promo code is GAS2B, a discount of RM28.00. This is the screenshot setting of the promo code. 1. You can track the number of people who redeemed your promo code from the Dashboard. 2. Go to Menu > Discount > List. 2. 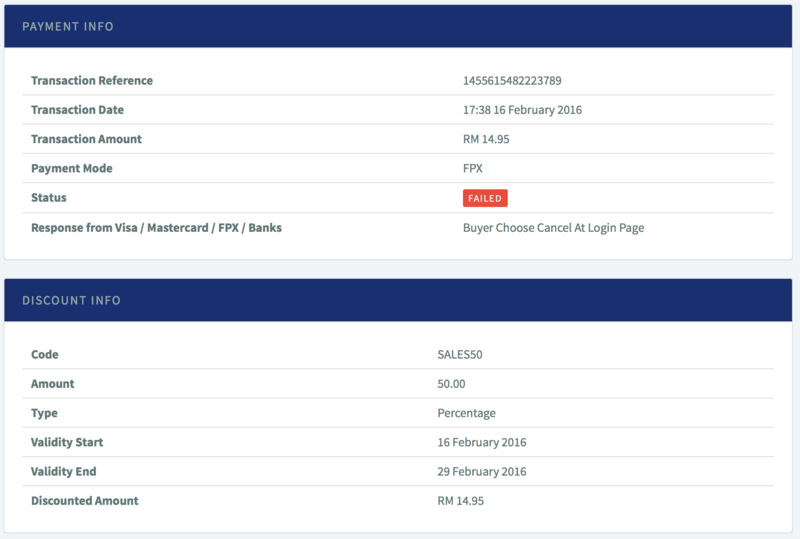 Refer to your Transaction page on your Dashboard, and click on the transaction detail. 3. You will see the details of the discounted amount and the promo code redeemed by your customer, if they use the promo code. 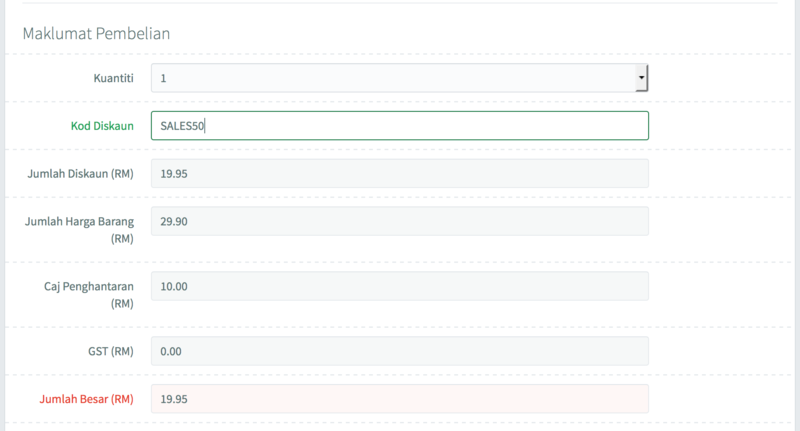 Please ignore the “FAILED” status as this transaction was done for the purpose of promo code example only. 1. The promo code is not case-sensitive. 2. For example, for promo code SALES50, your customer can either enter SALES50 or sales50 in the promo code field.